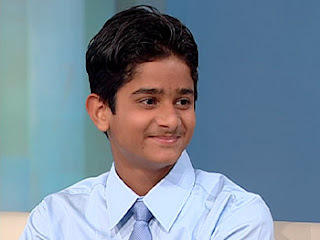 In February last, Akrit Jaswal, the miracle kid appeared on the Oprah Winfrey show. Akrit is a child prodigy who has been termed a genius right after his birth in 1993. When Oprah asked if he could understand Shakespeare at the mere age of four he answered, "I could understand it. That's why I was reading it". Years ago, footage emerged from a remote village in India. The video shows a young girl receiving surgery to separate her fingers, which were badly burned and fused together. Why did this operation make headlines around the world? The surgery was performed by a 7-year-old boy named Akrit Jaswal; a teenager from Himachal Pradesh, India . Now 13 years old, Akrit has an IQ of 146 and is considered the smartest person his age in Indi; a country of more than a billion people. This is an IQ level that beats even that of Albert Einstein. Before Akrit could even speak, his parents say they knew he was special. "He learned very fast," says Raksha, Akrit's mother. "After learning the alphabet, we started to teach him joining of words, and he started writing as well. He was two." While in class II he cleared exams meant for class V. His mother realized he was special when he would answer graduate level questions. After the surgery, Akrit was hailed as a medical genius in India. Neighbors and strangers flocked to him for advice and treatment. At age 11, Akrit was admitted to Punjab University. He's the youngest student ever to attend an Indian university. That same year, he was also invited to London's famed Imperial College to exchange ideas with scientists on the cutting edge of medical research. Akrit says he has millions of medical ideas, but he's currently focused on developing a cure for cancer. "I've developed a concept called oral gene therapy on the basis of my research and my theories," he says. "I'm quite dedicated towards working on this mechanism." Growing up, Akrit says he used to see cancer patients lying on the side of the road because they couldn't afford treatment or hospitals had no space for them. Now, he wants to use his intellect to ease their suffering. "[I've been] going to hospitals since the age of 6, so I have seen first hand people suffering from pain," he says. "I get very sad, and so that's the main motive of my passion about medicine, my passion about cancer." Currently, Akrit is working toward a bachelor's degrees in zoology, botany and chemistry. Someday, he hopes to continue his studies at Harvard University. However, Akrit’s progress came at a price: frustrated with the perceived lack of support for his gifted son, Akrit’s father became depressed and left the family home some time back, telling him not to get in touch until Akrit had found a cure for cancer. Adored by his self-sacrificing mother and treated as a genius, Akrit has no doubt he will do this. Akrit does not come from a rich family. Watch out for this boy in the days to come.